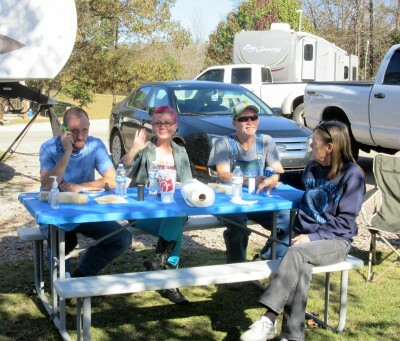 For those of you who have been reading our blog for a while, you may know that we actually began living in the RV on November 13, 2014. Plans were for us to move in the weekend after that date, but you know what is said about making plans. Extremely cold weather last year (read about that here) left us with a choice: move in two days earlier than planned, or winterize the camper and then undo it two days later. We decided not to winterize and moved in. (You can read about this decision here.) The first night in our Outback Sydney Edition 5th Wheel, complete with the Arctic Barrier package, saw lows in the low 20s, and we actually saw temps in the upper teens at night during our first week as it got colder than forecasted. Those temperatures are unusually low for Middle Tennessee, especially in the middle of November. Last Friday was November the 13th, and while the temperatures have been moderate, it just happened that Friday night was to be (and was) the coldest night of the season to date; it got down to about 30 degrees here. 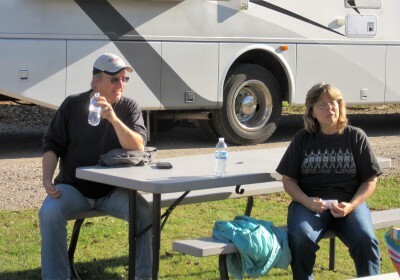 For a couple of months, Jim and I had been discussing having an RV-Versary celebration. Initially, we thought we’d have an outdoor affair on Friday night, but as the forecast became more cemented, our plans quickly changed to a Saturday afternoon event. Invitations were made and delivered. Ingredients for making chili and s’mores were purchased along with a variety of beverages. 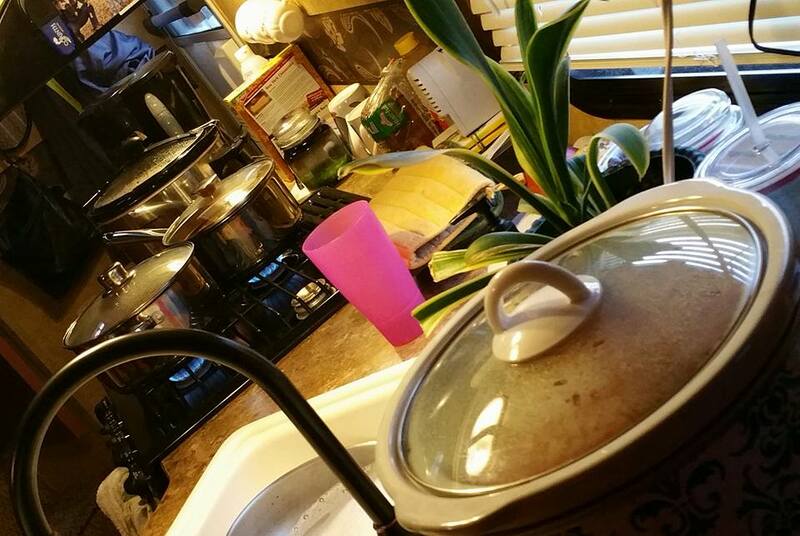 Four pots of chili is cooking. Saturday proved to be a gorgeous November day with temperatures in the 60s and lots of sun. 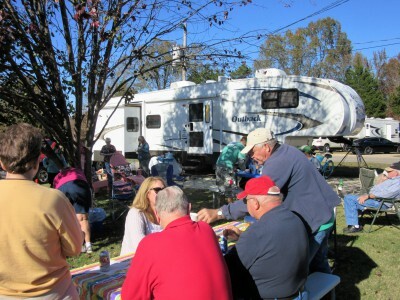 Family (those who live relatively close to us), friends, and complete strangers who just happened to be in the park this weekend joined us to help celebrate a year of living in our camper full time. 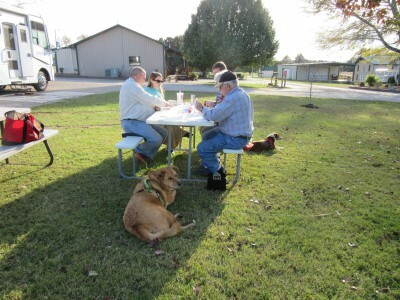 Below are some of the pictures that capture the food, fun, and fellowship of the day. Set up and ready, some of the family who are here grab an early bowl of chili. Green Acres owners and staff, along with family, join us. 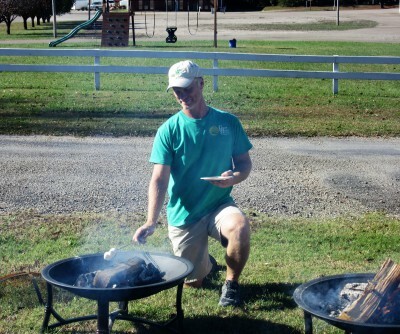 Campground manager Bill is making s’mores. 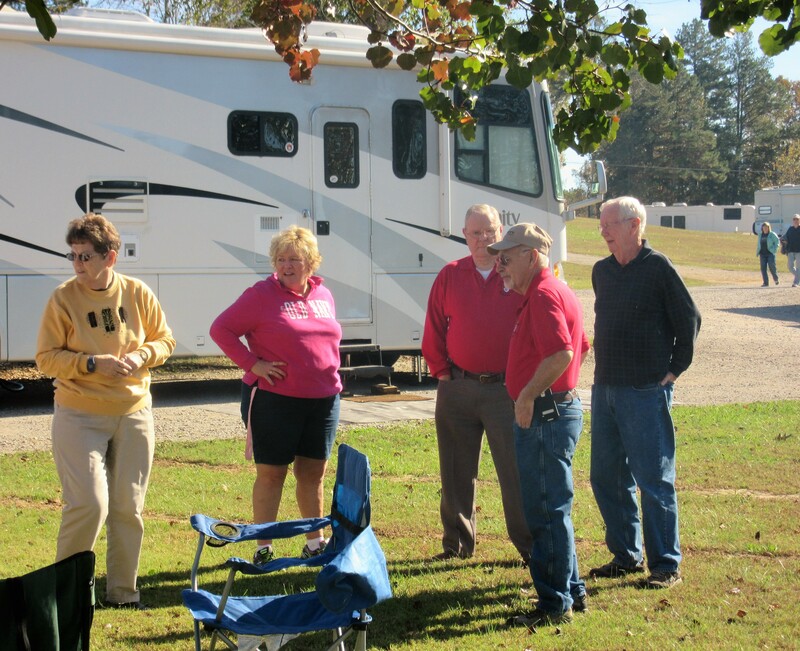 Some of the folks from Bluff City Good Sam’s Camping Club, having a rally here, come join us (lady in pink is co-owner Diane). More GA staff and former site neighbors from this past spring, who are here again, came. 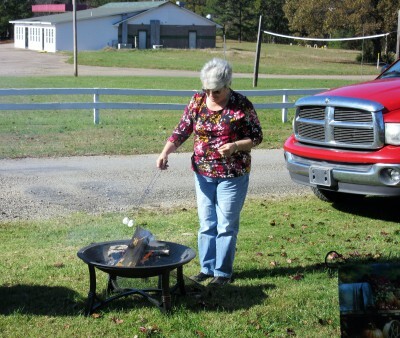 I finally convince Nancy (my step-mom) to indulge in s’mores. Folks we’d not yet met who live in the park joined us and became new friends. 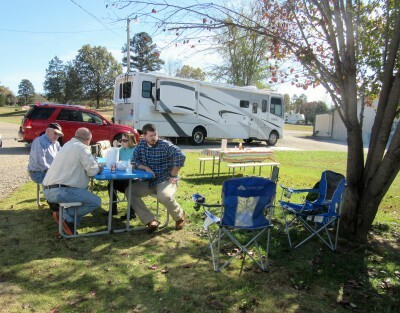 After our guests left, the family continued to enjoy the outside while playing cards. The pups kept watch. Jim, Dad, Nancy, Nathaniel (son), Rachel (daughter-in-law), and I all agreed that it was a lovely day and a fun party. We appreciate everyone who came by to celebrate with us. Jim and I also are thankful that family who were close enough to be here were able to do so; they also helped with set up and clean up, and that was fantastic!